- Push the panel slightly to display Time, Date, temperature, Timer, and Alamr turn by turn. 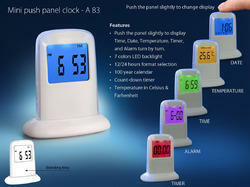 The mini push panel clock. Changes colors at the push of a button. 1) Push the panel slightly to display Time, Date, Temperature, Timer, and Alarm turn by turn. 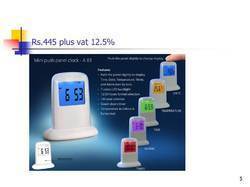 So as to uphold the standing we have built up, we are engrossed in presenting a broad compilation of Mini Push Panel Clock. - Push the panel slightly to display Time, Date, Temperature, Timer, and Alarm turn by turn. This clock can be used for control panel which is placed in Sub Station Control Room in Electricity Board and Factories. Customised with your brand logo.